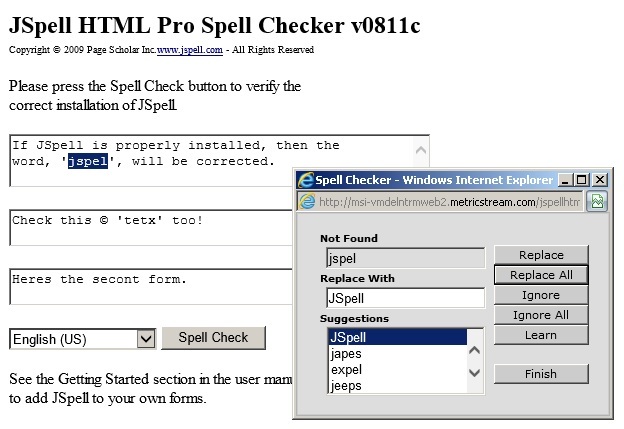 To start with jspell deployment in weblogic you shall already have the spell checker wars like jspellhtml.war and jspelliframe.war files. If not please go to http://www.jspell.com/ and download the war files according to your need. 1. Copy the jspellhtml.war and jspelliframe.war files to weblogic servers file system. 2. Create two folders jspellhtml.war and jspelliframe.war and extract the jspellhtml.war and jspelliframe.war files accordingly inside the folders. 3. cd to <WAR_PATH_ON_WEBLOGIC>/jspellhtml/WEB-INF/ directory and run below command to provide 0750(rwx-r-x—) permission to all files inside it in a single user env. and in multi user env. give 0770(rwxrwx—) to all files inside the jspell folder. Note: Do same for <WAR_PATH_ON_WEBLOGIC>/jspelliframe/WEB-INF/ locations jspell folder too. Note: Read/write is required for the lex_enGB.jdx and lex_enUS.jdx files to load into JVM successfully. 4. Login to weblogic admin console and navigate to Deployments and click on Lock and Edit button to start the deployment. 5. Click on Install button and Navigate to the extracted jspellhtml.war folder location and select the radio button and click on next. 6. Select the “Install this deployment as an application” radio button and click on next. 7. Select the target servers you want to deploy, incase you are deploying to cluster the choose cluster with “All servers in the cluster” radio button selected. 8. Put the name as jspellhtml and in the “Source accessibility” section select “I will make the deployment accessible from the following location” radio button. 9. Select the “Yes, take me to the deployment’s configuration screen.” radio button and click on Finish. 10. Once deployment completes click on the button Activate changes to activate the war and click on Deployments > Start – Servicing all requests to make the war active. 12. Do same for the jspelliframe.war file deployment too and put the deployment name as “jspelliframe” keeping rest done same as jspellhtml in previous steps. 1.a. 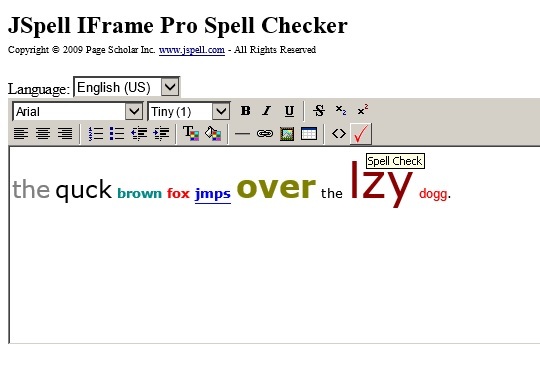 Open IE browser and hit below url’s to access the jspellhtml and jspelliframe spell checkers directly. 1.c. Once the test application gets loaded successfully, Click on SpellCheck button and use replace all button to correct the spelling mistakes. The spelling mistakes shall get corrected successfully. 2. 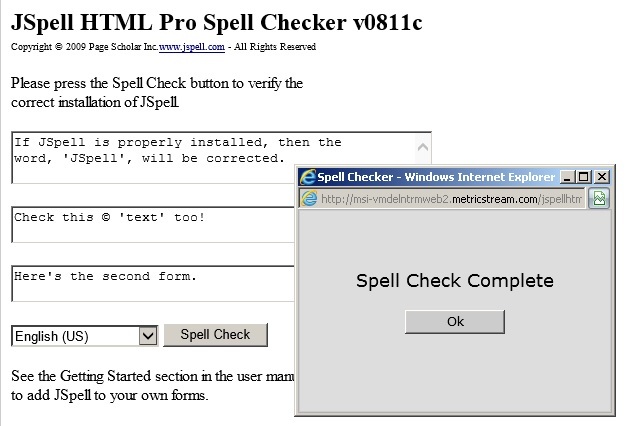 Once all above verification steps are successful, you can consider the spellchecker is successfully deployed. 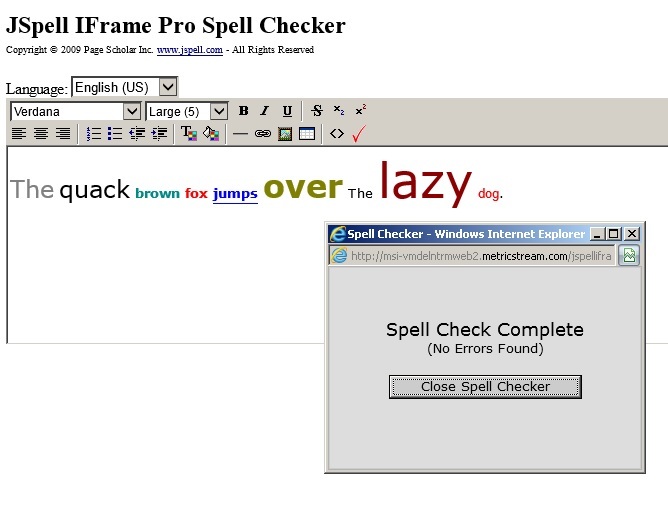 If you get below error “The spell checker is unavailable. 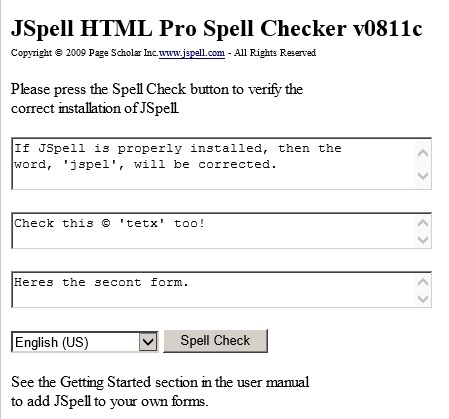 If you continue to receive this message, please contact your server administrator.” and “JSpell Has Not Been Properly Configured” like below while clicking on the spell check button. result in problems with the licensing technology used by JSpell. lex_enUS.jdx was not found in JSpell .jar files or on CLASSPATH. ERROR - Backup installation method failed. JSpell index was not installed! being called from other code please make sure arguments are correct. To resolve this error make sure weblogic service user have read and write prvileges on files at /opt/jspellhtml.war/WEB-INF/jspelll folder’s lex_enGB.jdx and lex_enUS.jdx files to load into JVM successfully. Note: Here /opt/jspellhtml.war/ is the location of extracted jspellhtml.war file.